During August 30-September 3 a Tar Sands Action took place at the White House in Washington, DC, with solidarity actions in a number of places across North America, and at Canadian and US embassies in a number of places around the world. The action was part of a campaign opposing construction of the proposed 1,702 mile Keystone XL pipeline that would bring bitumen from the Athabasca tar sands in Alberta to Texas and the Gulf States for refining. The Washington action was touted as the largest civil disobedience mobilization in decades. Among the protesters was a strong indigenous contingent from Canada. A petition with 617,428 signatures was delivered to the White House. By September 4, the number of people arrested numbered 1,252. 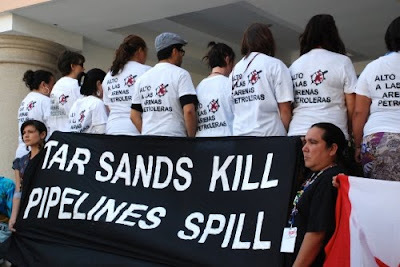 In this article, Dave Vasey provides an analysis of tar sands politics with a focus on indigenous struggles to stop the destruction of their lands and way of life. In the past five years, concerns about tar sands projects have provoked a global dialogue involving communities, governments, non-governmental organisations, financial institutions and the largest companies in the world. Much attention has been focused on Indigenous Peoples on the frontlines of projects, who attest that pollution from tar sands has traumatized ecosystems, rendered drinking water carcinogenic and devastated traditional ways of life. Rather than address concerns substantively, the Albertan and Canadian governments parrot propaganda crafted by industry and the far right promoting the tar sands as a form of ethical development. Seemingly, we are restricted to choosing between terrorist oil or Canadian oil. Questions about our continued investment in oil or Canada’s role in creating and promoting terrorism abroad are not on the agenda. The first meeting of the “big three” — Royal Dutch/Shell, Jersey Standard (now Exxon) and Anglo-Iranian (now British Petroleum) took place in 1928, and led to the founding of an international oil cartel. During this early period, government and industry imagined a “Fortress North America.” They envisioned economic scenarios where the Middle East was destabilized, Saudia Arabia held regional authority and Alberta boasted the lowest royalty rates per barrel of oil in the world. The destabilization efforts of the First and Second Gulf Wars and the occupation of Afghanistan created new political openings for massive tar sands development. Indeed, tar sands projects have exploded since the 2001 invasion of Afghanistan, in tandem with the establishment of the North American Free Trade Agreement and a seemingly blind faith in market and technological solutions for social and environmental issues. For the rich, an economic boom was created after the invasion through the TSX and Albertan legislature. Profits have been so great as to assist Canada’s elite in surviving the recent economic crisis, while the rest of us face the impacts of industry layoffs and government austerity measures. For Indigenous peoples living in the tar sands region, the boom has had brutal impacts, rendered more acute by the ongoing legacies of colonialism, invisibilization and assimilation. In Alberta, ground zero for tar sands mining projects, 40 years of conservative rule have required Indigenous peoples to navigate a series of racist policies designed to dispossess them of their traditional lands. Perhaps like nowhere else in Canada, anti-indigenous racism in Alberta remains normalized. The United Nations has exposed one acute example of this by three times ruling Canada in breach of international human rights standards for the treatment of Alberta’s Lubicon Cree Nation. The common stereotype is that First Nations merely used bitumen to gum their canoes and did not have insight into the future prospects for tar sands development. Yet according to Elders in both Lubicon territory and Fort Chipewyan, old people have long suggested that when bitumen was taken from the ground, the land would be destroyed and the water turned to poison. The past 30 years has witnessed powerful wins by First Nation communities through land defense and active resistance. This in turn has created legal precedents for Indigenous land rights and a nascent revision of Canadian history to acknowledge the colonization of Indigenous peoples. In response to public pressure, governments have constructed a complex bureaucracy to “consult and accommodate” Indigenous peoples. However, the consultation process does not include the right to say no to development projects like the tar sands, and there are serious obstacles to meaningful consultation (see the note about consultation below this article). In contrast, tar sands promoters point to expanded employment opportunities for Indigenous Nations as an example of the “ethical” nature of tar sands development. The logic goes that oil extraction within the Canadian state is a benign alternative to “dirty” oil from the Middle East, where terrorism, dictatorships and war prevail. Put another way, it becomes “civilized” Canada’s international obligation to develop the tar sands. But from an Indigenous perspective, the ethics of tar sands development are highly questionable. The jobs created for communities come with a heavy price in terms of health, cultural traditions and ways of life. At the same time, Indigenous advocacy in opposition to tar sands is often portrayed as irrational and violent. Organizing largely without funding Indigenous youth sharing their stories has resulted in entire communities in the tar sands region being characterized as potential terrorists by right wing think thanks. In 2009, the Canadian Defence and Foreign Affairs institute warned policy makers of potential terrorist acts from Indigenous “warrior societies” with “eco-terrorist” allies in Northern Alberta. Essentially, this translates as a threat of criminalization for speaking out about environmental and social issues associated with the tar sands. Yet, as plans for tar sands have been international, so has Indigenous resistance. Recently, elaborate proposals for using new and existing pipelines to transport the bitumen to southern markets have been the target of opposition. The traditional Wet’su’wet’en government has built cabins in the path of the proposed Northern Gateway pipeline and issued final notices of trespass to Enbridge to protect their lands. In response, Enbridge has begun to question whether they can finance the project at this time. It seems the pressure is working. Due largely to advocacy from First Nations, particularly community members from Fort Chipewyan and the Lubicon Nation, Canada has been exposed internationally as an environmentally and socially destructive petro-state. Indeed, as Canada embarrassed themselves in Copenhagen and Cancun during climate negotiations, Indigenous activists from the tar sands region held the microphones of the international media, getting the true story out. Dave Vasey is an environmental justice activist living in Toronto, Ontario. Dave was born and raised in Walkerton, Ontario, but then moved to cities for school and became part of the rural brain drain. Indigenous peoples are not merely another group of stakeholders in development processes. Rather, they are sovereign nations that hold a nation-to-nation relationship with the Federal government, and bear the right to say “no” to development. The right to say no is fundamental to the United Nations Declaration on the Rights of Indigenous Peoples, a minimum global standard that Canada signed but refuses to commit to in practice. The courts have established that Canada bears a constitutional duty to “consult and accommodate” aboriginal peoples (the constitutionally circumscribed term for Indigenous peoples) in planning development that will impact their traditional territories. It is Canada’s failure to fulfill this duty in letter and spirit that is the basis for litigation by First Nations in the tar sands region. This entry was posted in First Nations, Organizing, Tar Sands. Bookmark the permalink.